I need the ability to have the pump start relay active on some zones and off on other zones. Hopefully this feature can be added soon. Thanks. Where are we with this, it is desperately needed. What is the status for this minor enhancement?.. going on 4 years. This is crazy. This is a buy/or go elsewhere decision for me. 4 years to make a simple software change for important functionality?? worrying. time to look at open source. I need the same feature. WHEN will you include this software update??? Is there any update on this software request? Need better control over the master valve circuit. I am a little concerned about this, I switched from OpenSprinkler (which is $80 less) which had this feature. I am starting to regret it after reading this thread…I hope it happens soon, or will need to look at if I am able to return. @rpw128 - how many zones need or don’t need the master valve activated as there is an easy way to accomplish this for a few zones using relays. I attached a drawing (hopefully it’s visible). Essentially I expanded my sprinkler system as my yard has evolved. The supply lines to the front are PEX so they are better rated to have pressure all the way. The supply lines to my side yard are Poly (which my understanding is not “supply rated”) so I put a valve in front of it to “protect” it. Depending on how troublesome the relay solution is I may just see if I can return the Rachio. As I see it, I lost a major functionality of my previous [OpenSprinkler] where I thought this would be an upgrade. Appreciate the help and curious how much time and cost is involved to put a relay. 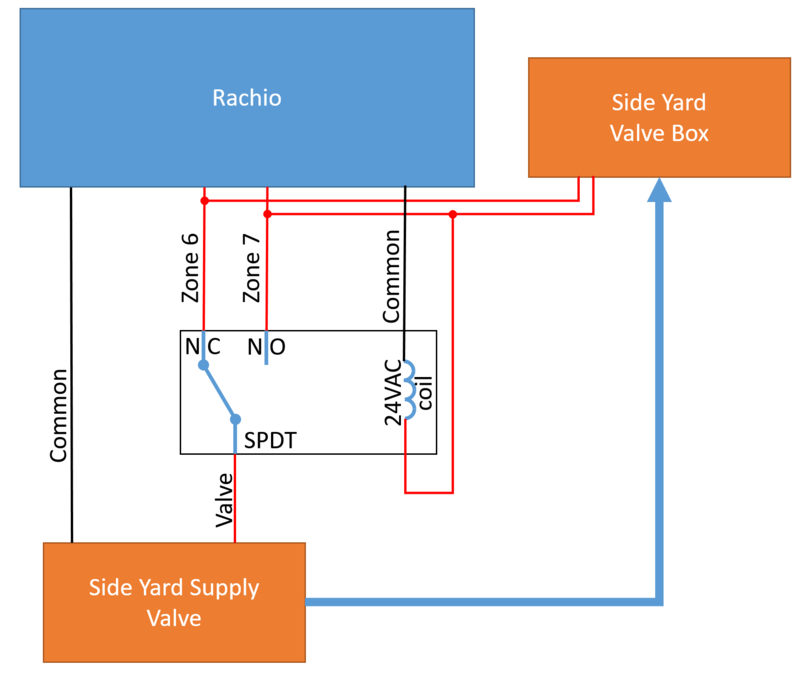 Looking at your schematic, it may be easier to simply connect Side Yard Supply valve (currently zone 5) to the master valve output (currently unused). This should make everything work. 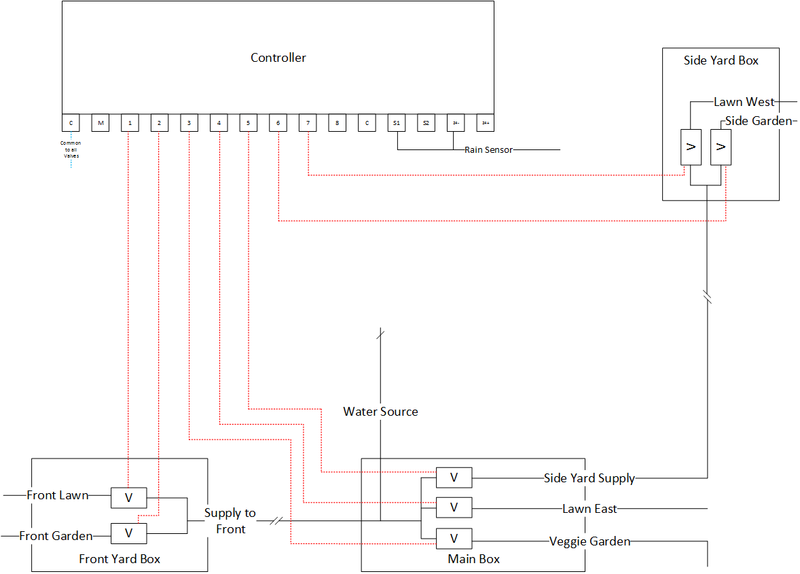 While the yard supply will be pressurized when ever any of the other zones are running, it should not actually activate given that you have individual control over the valves within the side yard box. Thanks for the reply. I did have it this way initially but I think from repeated pressure the Poly/PE pipe got pushed out of the valve and the box flooded (thus losing pressure to every zone). I since reconnected with a new section of pipe, but fear it will happen again. It’s also just not good practice to keep pressurizing a section of pipe like that (considering exactly what happened to me…will happen). It’s exactly the reason I put a master on that section since I didn’t want to replace the whole line with PEX. The relay solution mentioned by @DLane or switching the controller would avoid having to over-stress that section. @rpw128 - For just two zones I would put in two Single Pole Single throw (SPST) normally open relays that would active the side yard master valve that is on zone 5. The relays are inexpensive, ~$7-8 last time I looked. Zone 6 - two wires, one to the Lawn West and one to the coil wire on the relay. Relay Common - 24 V- VAC (if you have a Gen 3, then I think you’d use the 24-VAC terminal and a Gen 2 I believe you’d use the SC (@Gene determined this is right one to use, instead of SP) - unless Rachio has changed things with the Costco version or an updated hardware. Relay Normally Open Pole - output to the Side Yard Supply valve, can be combined together with the other relay pole. Zone 7 - two wires, one to the Side Garden and one to the coil wire on the relay. Relay Common - 24 V+ VAC (if you have a Gen 3, then I think you’d use the 24+VAC terminal and a Gen 2 I believe you’d use the SC (@Gene determined this is right one to use, instead of SP) - unless Rachio has changed things with the Costco version or an updated hardware. For relay, look for one with a 24 VAC coil that is normally open. FAN RELAY. 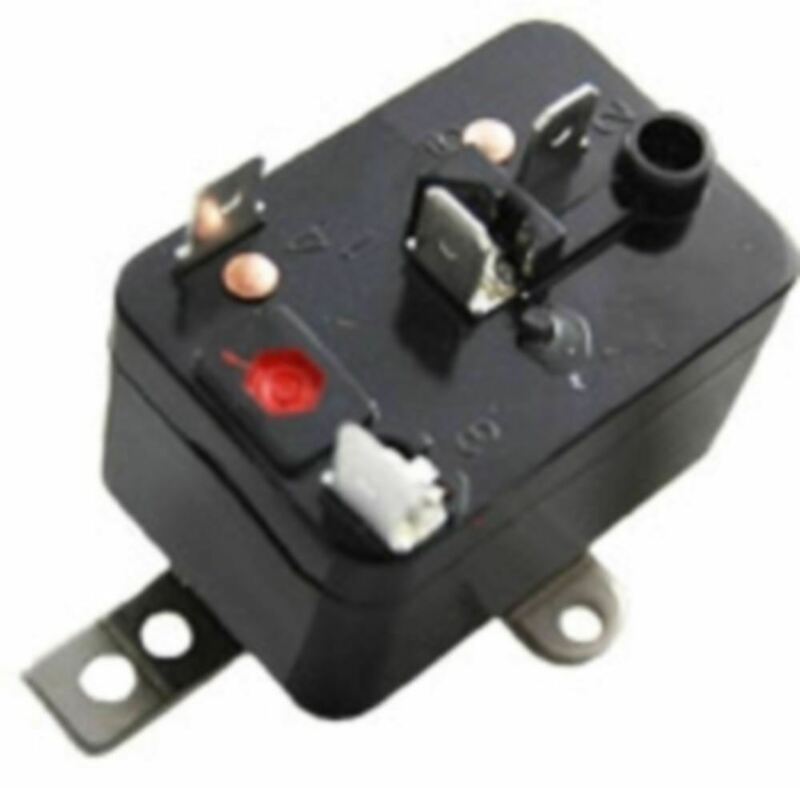 USED FOR SWITCHING SOLENOIDS / FAN MOTORS / & OTHER APPLICATIONS. Boat and RV Accessories stands behind all of our products. All of our products are held in very high standards against the competition. | eBay! One can use a SPDT (Single Pole Double Throw) relay, instead of the SPST, just use the Normally Open and Common tabs (don’t use the Normally Closed tab). Let me know if you have any questions, the wiring and relays are easy and will all be right there by the Rachio. Can rachio open two valves to water a single zone? If the poly got pushed out before, it may be a good idea to get a few of these guys (link) from your local home improvement store (search for right size for the pipe, no need to get a whole set) and secure the ends well. Even with precautions, the pipe may come loose again if not properly secured. What @DLane has described is a viable solution, but you would need to use 24-VAC terminal (instead of 24+VAC) in the configuration that he has described since Rachio Commons are connected to 24+VAC. I’ve thought about using just one SPDT relay (similar to the one @DLane has linked to), here is the schematic to help illustrate the approach (zone 5 would be unused in this configuration). In this configuration which ever zone is connected to NO terminal, also drives the coil. (in this example, it’s zone 7, but can be any other zone as long as it is connected to NO terminal). @DLane’s approach may prove to be better, in case the two valves and a relay running off of one zone (as in with my version) draw more than 300 mA combined (at which point Rachio may start showing errors due to a high current on an individual zone). And you would have to improve upon my design! While your design has just one relay, I was trying to KISS, by keeping everything similar and allowing for more than two zones. To provide more detail for @rpw128 - zone 6 would power the side yard master valve when that zone is active as it is on the Normally Closed connection, no power to the side yard master valve when zone 6 or 7 is not running. 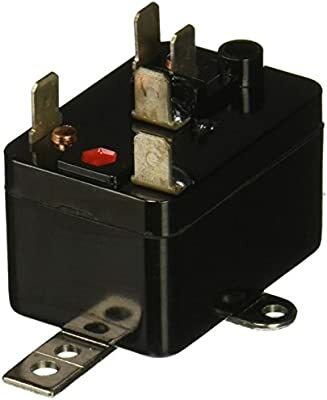 When zone 7 fires, it would close the relay coil and power the master valve (zone 6 is NOT connected to the relay coil). Awesome, thanks, I will give this a whirl for $8-10, appreciate the wiring diagram. I was going to put the worm clamp on but I realized it as soon as I pushed in the PE to the barb. Will need to snip it off and redo it though as it is a good idea. One question on the above design from @Gene, currently all commons are spliced together. Should I undo this for Zones 6/7 and if so where do they go? I do not understand why one would want a master valve to not effect specific stations. It defeats the purpose of a master valve. This is not possible. @rpw128 - Keep all the commons together. You can put the additional common from the relay into the other C port. @DLane is right. If you have an extra ‘C’ terminal available on Rachio, connect it to one of the coil terminals on the relay (polarity doesn’t matter). It also doesn’t matter which C terminal on the Rachio you use, as they are all interconnected. I installed the relay today took me a little bit to figure out the wiring but it works. When in doubt the software fails…find a hardware solution I guess!